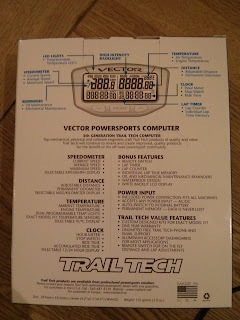 The Trail Tech Vector that i ordered a couple of days ago arrived today! As you can see from the time in the photo, i only managed to get to play with it late at night, so certainly not had chance to install it on the bike yet but i couldn't resist getting it out of the box and having a little play with it. My initial impressions of the Trail Tech Vector Stealth are that its a pretty solid looking product. Well mate and a lot more glossy in colour than it looks on the TrailTech website. 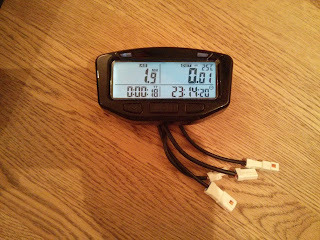 I ordered the complete kit for my KTM 300 exc which includes the inline temperature sensor, the speedo sensor and mounting bracket. 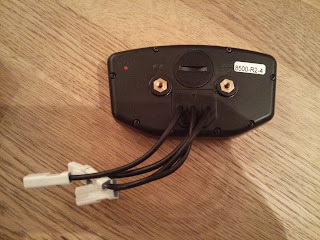 I was pleased to discover that the temperature sensort housing is made from black anodised metal, and not horrible plastic as i was expecting. Also the cable is very flexible, if possibly a bit short, but i wont know until i try it on the KTM. The Speedo sensor is the magnetic type. I need to attach the included magnet onto my front brake disc and the sensor on the brake caliper bracket. The cable from the sensor the the main unit is cased in a protective sleeve to help keep it safe from rocks and branches. 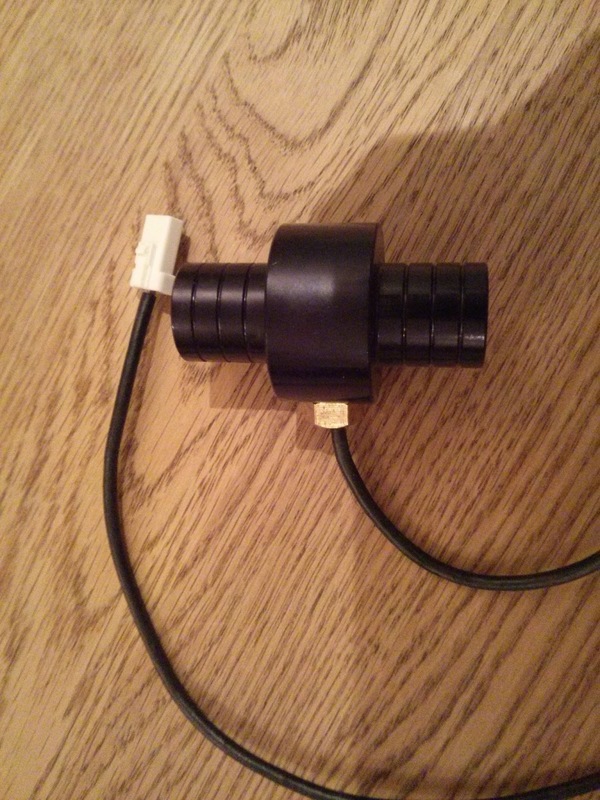 On the back of the unit is the battery compartment and two captive nuts for mounting the unit. The battery in the TrailTech Vector is a CR2032. 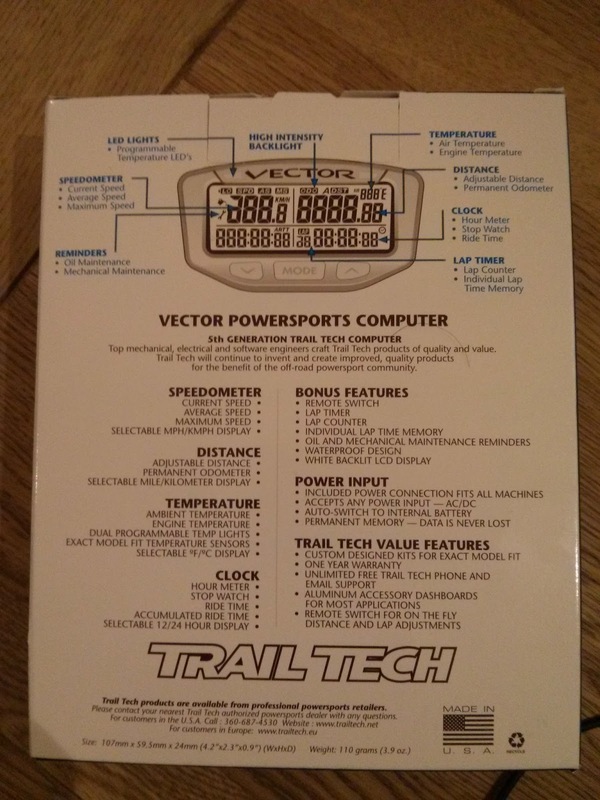 Here you see th back of the box describing all if the Trail Tech Vector's functions and features. One thing i have been disappointed to discover is that the "Hour Meter" is based on the wheel speed sensor, so it will record moving hours, and not actual engine hours. This is disappointing because since im fitting this to the KTM300 and the bike wont always be moving forward when the engine is running, so the "Hour Meter" working on wheel revolutions is going to record a very different figure to an proper engine hour meter fed from the ignition coil. Besides the hour meter disappointment im pretty impressed with the unit so far. Of course the real test comes when i come to install it on the bike..